【Extra Thick & 100% Waterproof】Made with breathable and thicker PE material, with Drawstring Hood and Elastic Sleeves,100% waterproof. 【Lite Package & Easy Storage】Each poncho Packed individually it\'s in own bag, easily fold in small size, just keep in pocket,backpack,and car for emergency. 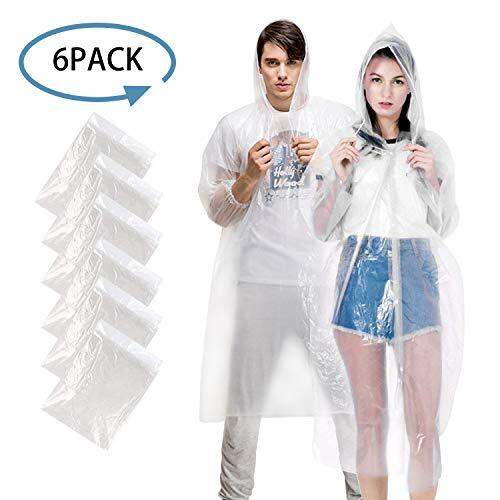 【Suitable For Outdoor Activities】One time use ponchos perfect for disney,theme parks, camping, hiking, backpacking, outdoor survival, fishing, traveling, backpack trips, festivals, sports events.